On February 23, 2013, the Church of Scientology Pretoria cut the ribbon on their new home, located at the heart of the capital’s diplomatic quarter in Arcadia. 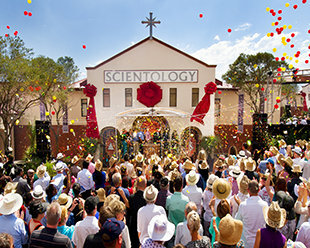 On Saturday, February 23, 2013, more than a thousand Scientologists and guests celebrated as a ribbon fell to herald the opening of the new Church of Scientology Pretoria. The campus meets the needs of the Church’s growing congregation and serves as a center to extend humanitarian initiatives and community outreach programs throughout the northern Gauteng Province. South African royalty and national, provincial and city dignitaries joined in the dedication ceremony of the new Church of Scientology Pretoria on Saturday, February 23, 2013. The ribbon-cutting celebration commenced with the South African national anthem. Church of Scientology Pretoria The new Church of Scientology Pretoria stands on the doorstep of the Union Buildings, the official seat of South Africa’s government and home to the offices of the president. The campus, just steps from Embassy Row, is comprised of five heritage homes originally constructed at the turn of the 20th century. The Church meticulously restored the Edwardian style buildings and altogether transformed them into a 21st century Ideal Organization. Church of Scientology Pretoria Pretoria’s Scientology Ideal Organization stands on Stanza Bopape Street, in the governmental quarter of the capital city. The new Church accommodates the full range of Dianetics and Scientology services for parishioners as well as humanitarian programs to serve this city and its greater diplomatic community. Reception The Church welcomes all visitors wishing to obtain an introduction to Dianetics and Scientology. Scientology Public Information Center The Church’s Public Information Center provides a complete introduction to every aspect of Dianetics and Scientology—including the beliefs and practices of the religion as well as a biographical presentation on the life and legacy of Founder L. Ron Hubbard. The Information Center further presents exhibits on the many humanitarian initiatives and social betterment programs the Church sponsors. Visitors are welcome to take a self-guided tour of the Center’s displays at their leisure and to return as often as they like. Introductory Courses The Church houses multiple classrooms for introductory courses on Dianetics and Scientology principles and their application in life. Introductory Seminars One of several Seminar Rooms providing for evening and weekend seminars on the fundamentals of Dianetics and Scientology. Dianetics and Scientology Bookstore The bookstore makes available Founder L. Ron Hubbard’s scripture on Dianetics and Scientology. In all, Mr. Hubbard’s legacy comprises tens of millions of published words in dozens of books and thousands of recorded lectures. These materials are available in 50 languages. The Purification Center The Purification Center is where L. Ron Hubbard’s Purification Program is delivered. Mr. Hubbard developed the program to free individuals from the mental and spiritual damage caused by drugs and toxins. THE PURIFICATION CENTRE mural pays homage to Gauteng’s Witpoortjie Falls. Hubbard Guidance Center The Hubbard Guidance Center is where Scientologists participate in auditing (spiritual counseling). Beyond this waiting area are dozens of auditing rooms to meet the needs of the Church’s growing congregation. Scientology Auditing Room Scientology auditing (spiritual counseling) is delivered in dozens of auditing rooms, each of which provides a quiet, distraction-free environment necessary to achieve spiritual enlightenment. THE ACADEMY The Academy is where Scientologists train to become auditors (spiritual counsellors), capable of applying the technology of auditing to help others attain spiritual freedom. Our Pretoria Academy comprises multiple course rooms, each devoted to a different aspect of training. Café The Café welcomes those touring the Church or attending its many scheduled events. It is further provided for parishioners during breaks in their Scientology services. The Chapel The Chapel is the site of all Scientology congregational services, including Weddings, Naming Ceremonies and Sunday Services open to members of every denomination. The Chapel In addition to providing for Scientology gatherings, the Chapel serves as an ideal venue for workshops, banquets and events in the name of collaboration for the betterment of Pretoria. The Office of L. Ron Hubbard Traditional in all Churches of Scientology is the Office of L. Ron Hubbard, honoring the religion’s Founder and symbolizing that this Church is true to his writings and ideals. ONE OF THE FIVE heritage homes the Church restored, with its verandah and Tuscan columns, is a prime example of a Pretoria residence from the Edwardian era. AMONG THE FEATURES the Church restored and returned to their original condition is the bay window on this heritage home, typical of the Edwardian Arts and Crafts style. THE CHURCH FAITHFULLY restored the work of the skilled craftsmen who left their indelible mark on the turn-of-the-20th century residences, including the Arts and Crafts styled portal windows of textured art glass. A CENTURY OF PAINT was removed from the wood sashes and mullions preserving the heritage home’s original ten-paned Arts and Crafts windows. AMONG THE HISTORICAL FEATURES the Church restored in the heritage homes is this cast-iron fireplace with its carved hardwood mantel and ceramic tiles of South Africa’s abundant proteas and hibiscus. THE CHURCH OF SCIENTOLOGY’S NEW HOME comprises five heritage houses on Stanza Bopape Street, neighbouring Union Buildings Gardens. The homes were fittingly employed as residences for architects, artisans and labourers during the construction of the Union Buildings between 1910 and 1913. A century later, the Church meticulously restored the complex of heritage homes to serve Pretoria for generations to come.